The Lantern Festival is celebrated on the fifteenth day of the first month in the lunar Chinese calendar. The festival marks the final day of the traditional Chinese New Year celebration and signals the start of work in the new year. 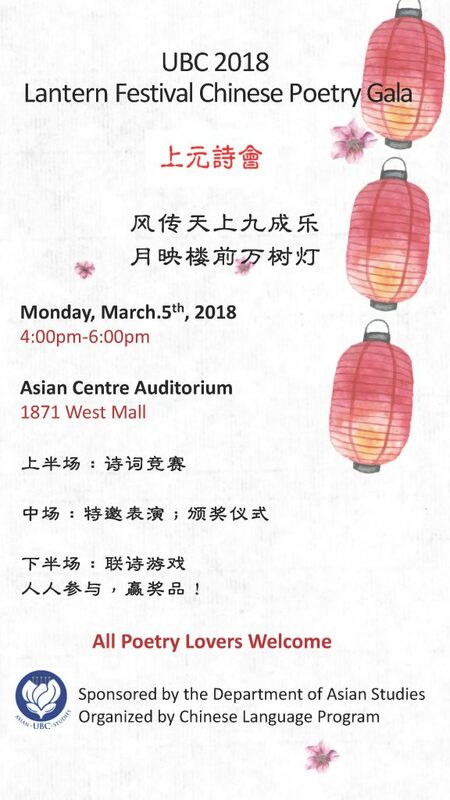 On March 5th, The UBC Chinese program will hold the 2018 Chinese poetry gala to celebrate the Lantern Festival in a traditional yet entertaining way. Students from Chinese 450+ level courses will showcase their mastery of the Chinese classical poetry in a competition and win prizes! All are welcome to come and enjoy the beauty of Chinese classical poetry as well as participate in the exciting lantern festival entertainments. You can search for little strips of paper containing lines of poetry on the lanterns to spot a classical poem and win an exquisite Chinese style souvenir!